100% Cinsaut, 100% kiff. Made by Johan Meyer and peddled by Krige Visser, this is the wine you need to have a few cases of come summer, or when you next have a thirst. Cinsaut was once widely planted in South Africa (we confusingly called it Hermitage, despite that French Appellation having nothing to do with the grape) and hooked it up with Pinot Noir. A relationship that hasn’t ended well at all. Cinsaut is also famous in Lebanon where it forms part of the world-renowned Chateau Musar. To the wine. It’s 100% Swartland fruit, and there is a lot of perfume going on here. Krige calls it the Pinot of the Swartland. The colour’s right for that too. Light, dainty, and gently coloured. The colour you would use to paint the baby Christ’s rosy cheeks. The nose is typical of Cinsaut; fragrant and perfumed, with spice and – this is going to sound weird, but it’s a good thing in this context – paint. It really does smell wonderful. I honestly wouldn’t mind it for myself: Cinsaut for men. On the palate there’s a burst of cherry, a hand-grenade of sour cherry, a lover’s slap of red fruited, lip-smacking WOOHOOO. It zips through your mouth like a Malinga slower yorker; silky, smooth, sharp, accurate, beautiful. After the red-fruit explosion it’s all lightness. Light as a faerie’s eyelash. The tannins arrive late, very fine and hardly present, before a chalky/dusty mineral finish. It’s not a multi dimensional wine, it’s not a wine to write a novel about, or even an epic, I think it would be happy with a limerick. It’s a wine with angles, and fruit bursting at its seams. It has lightness, it has class, but most importantly it’s a wine I can drink. Not sip and take some notes, drink. A bottle of water in the desert drink; the way you drink in your lover as s/he crosses a restaurant floor, five minutes late; the way you drink in your favourite series, episode after episode after episode. I’m going to be reviewing lots of wines in the future. But this isn’t a review. This is biased. This is my kind of wine. I dig it. I dig it hard. Aged in very old 225l oak barrels. Bottled December 2012. I agree. This is what Cinsaut should taste like. I had a 14.5% ABV Collaboration Cinsaut 2011 a while ago and I remember thinking that attempts at powerful Cinsaut are doomed to miss the mark. Power is not always called for. You don’t arm wrestle a pretty lady in order to charm her. I’m also now thinking of the expression “swimming pool wine”, which, in red wine terms, is generally used for fairly crappy wine with little tannin. Who wants to drink that around the swimming pool (or anywhere else)? 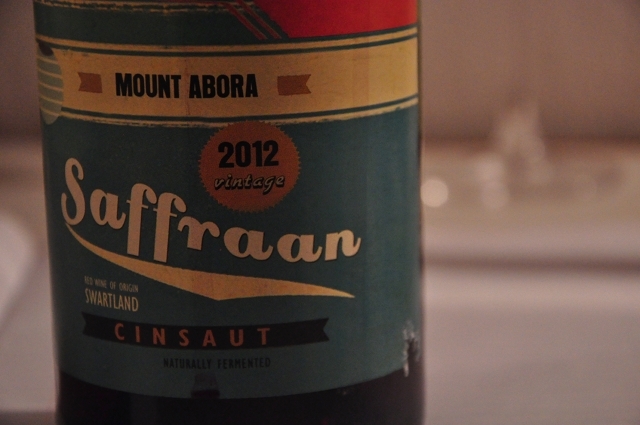 The Saffraan is my kind of swimming pool wine. Ya, I don’t really understand the point of trying to make a turbo charged cinsaut. It’s the fragrance and perfume of it that is amazing. That’s why it is added to other bigger blends, to had a perfumed dimension. It makes me sad to think of all the cinsaut that has been uprooted. Imagine a selection of different fresh, bright perfumed and fruity cinsauts to choose from? Especially as it only seems to start working as a stand alone variety when the yeild drops. Old vines + Cinsaut = winners. And it helps if such old vine fruit lands in the hands of a winemaker that’s not too set in his/her ways to understand that sometimes less is more. Sure, girls with silicone breasts and botoxed faces will get the stares, but so will car crashes. You drank wine instead of beer after a long harvest day? You either love wine more than anyone thought possible, or that wine is even better than I thought.